PT Vale Indonesia Tbk - PTVI - previously known as PT International Nickel Indonesia or PT International Nickel Indonesia Tbk or INCO - is a reputable public-listed integrated mining company in Indonesia with core business focus on nickel mining with the processing of nickel laterite. Vale Indonesia has a license from the Government of Indonesia to explore, mine, process and produce nickel. Vale Indonesia has processing plant in Sorowako South Sulawesi with a total 118.435 hectares of Contract of Work (Cow) agreement with the Government of Indonesia. Vale Indonesia is listed in Indonesia Stock Exchange (IDX) under ticker code "INCO". PT Vale Indonesia Tbk - - is a local subsidiary company of Vale SA (Vale Group), a global mining company from Brazil. As of December 2016, Vale Group through Vale Canada Limited (VCL) holds 58.73% shares in PT Vale Indonesia Tbk. Other remaining shares in Vale Indonesia was owned by Sumitomo Metal Mining Co Ltd (20.09%), Vale Japan Limited (0.55%), Sumitomo Corporation (0.14%) and public shareholders (20.49%). According to PT Vale Indonesia Tbk annual report 2016 as cited by JobsCDC.com, Vale Indonesia reported total net revenue of US$584,143,000 in 2016. This total net revenue figures reflected a 26% decrease from US$789,745,000 in 2015. 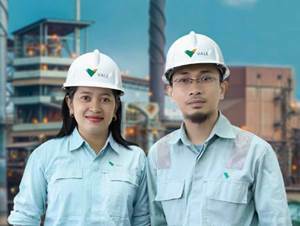 Vale Indonesia's total profit for the year 2016 amounted to US$1,906,000. This total profir decreased by 96% compared to the year 2015 amounted to US$50,501,000. Background in University Degree (S1) from a reputable university, majoring in Civil Engineering discipline with minimum GPA of 2.85 (scale 4.00). The candidates with specialization in Civil Structural is preferred. The candidates with prior experience for 1-2 years in Civil Engineering design on heavy industrial plant is preferred. Strong Bahasa Indonesia and English language skills. Resident of Kabupaten Luwu Timur. Interaction management skills (oral and written communication, human relations). Advanced knowledge of engineering operating systems. Basic knowledge of project management systems and principles. Basic knowledge of civil engineering, including but not limited to engineering design software and manual calculations. Basic knowledge of multi discipline engineering design - civil structural, mechanical, electrical and instrumentation. Basic knowledge of the nickel production process - from raw material to final product and auxiliary system. Basic knowledge on procurement and contract administration process. Basic knowledge of project cost estimation. Basic knowledge in EHS system and policies. Basic knowledge of applicable engineering design standards, national and international standards. JobsCDC.com now available on android device. Download now on Google Play here. Please be aware of recruitment fraud. The entire stage of this selection process is free of charge. PT Vale Indonesia Tbk - Recruitment Junior Engineer Vale Group April 2018 will never ask for fees or upfront payments for any purposes during the recruitment process such as transportation and accommodation.